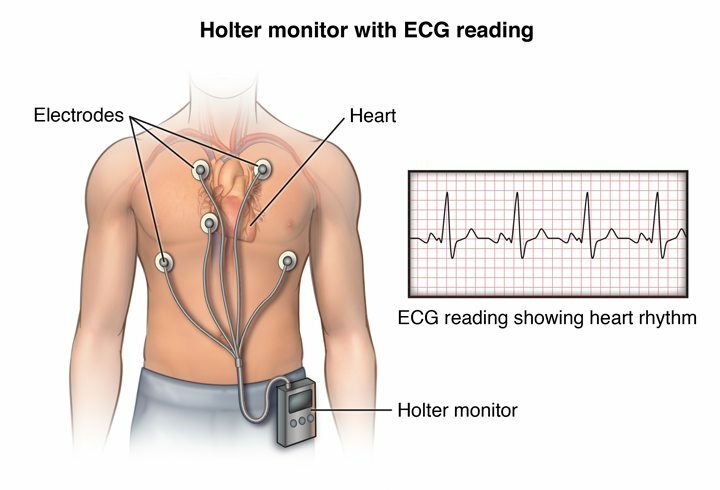 A Holter monitor is a battery-operated portable device that measures and tape records your heart’s activity (ECG) continuously for 24 to 48 hours or longer depending on the type of monitoring used. The device is the size of a small camera. It has wires with silver dollar-sized electrodes that attach to your skin. The Holter monitor and other devices that record your ECG as you go about your daily activities are called ambulatory electrocardiograms. What should I expect with the Holter monitor? Once the electrodes are in place, the technician helps you put the Holter monitor on and explains how to take care of it. After the test period, return the monitor to the technician. He or she will process the record of your heart activity and prepare a report for your doctor. This will include the notes in your diary. You should get the results of the test in one or two weeks.